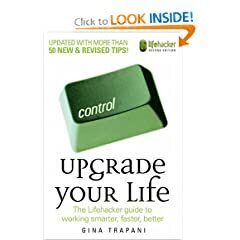 My lovely wife bought me Upgrade Your Life: The Lifehacker Guide to Working Smarter, Faster, Better for Valentine's Day. I'm a big fan of the lifehacker website, and this book is a good companion to the website. Depending on your comfort level around computers and your exposure to personal time management techniques like Getting Things Done, the book is a pretty quick read. I finished it in two days. The book is broken into a series of tips, called hacks. My biggest complaint about the book is sometimes the hacks don't appear in logical order. For example, Hack 74: Setting Up a Home Web Server references giving your website a hostname with a service like DynDNS.org, but doesn't explain how to do that until Hack 76. That's only a minor gripe, when you get to the DynDNS part in Hack 74 it tells you to reference Hack 76, so you aren't lost; it's just kind of annoying. All in all, this is a good primer book for anyone wanting to tweak their computer or time management skills, without being committed to an entire book devoted to a complex system. I'd like to forward Hack 3: Craft Effective (e-mail) Messages to most people in a corporate setting. Tips: Determine your purpose, use an informative subject line, be succinct, make it clear why everyone got the message. I've been using Hack 1: Empty Your Inbox (and Keep It Empty) for awhile, and to say it changed my life is over dramatic, but everyone should give it a try. Bottom Line: This book isn't going to teach you how to conquer the world, but it's full of interesting nuggets like how to perform better Google searches, managing a doable to-do list, and step-by-step instructions for some pretty neat computer tricks. It's a book that would be hard pressed to be over most people's heads, yet has enough advanced stuff as to not be a wasted read for more seasoned computer geeks. If you like the lifehacker site, you'd probably like this book. I had a little scare this afternoon while trying to add my new blogger email address to my Thunderbird address book; I got a message claiming my address book was corrupt. On a whim, I deleted all of the superfluous lines at the end of my file, and saved the edited file as abook.mab. I was able to open up my address book and get all of my old contacts back. This is one of the most popular posts on my site, but I never get any feedback from it. I'd love to hear in the comments section if this works for anyone else or not. I'd hate to leave bad information out there. As soon as Heather and I get our job situation figured out, I think I've found a great weekend project for me... building a new multimedia center.